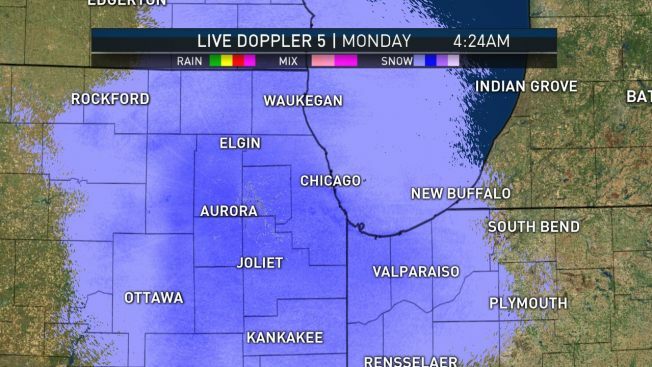 Another round of spring snow fell across the Chicago area beginning Sunday night, as the region began a week that will feel much like a tale of two seasons. NBC 5's Susan Carlson reports. Another round of spring snow fell across the Chicago area beginning Sunday night, as the region began a week that will feel much like a tale of two seasons. The snowfall began in the western suburbs late Sunday, moving east into the city overnight and continuing into Monday morning. Precipitation covered the entire region, and scattered light snow will keep falling through the morning - but there will be little to no accumulation for most. Some western areas could see up to 1 inch at most accumulate on elevated and grassy surfaces. By 12 p.m., it's likely that the snow will transition to rain before ending in the evening. While the snow has made April feel more like winter, spring weather is on the horizon. After a chilly Monday, temperatures will gradually increase over the week: into the mid- 40s Tuesday, then 50s to near 60 degrees on Wednesday. The Chicago area may even see highs climb near 70 on Friday before temperatures fall back to the 40s again over the weekend.